Ever wondered why dogs roll in fox poo? Our cheeky pooches often like to eat and cover themselves in things we humans find repulsive. The joys of being a dog owner, right? But there’s one smelly substance our dogs can’t get enough of. At first glance you may think your dog has rolled in mud. Seems innocent enough – just a quick hose down should do the trick. But on closer inspection you’re hit by the pungent, musky odour of fox poo. A smell that sticks around for days without a good scrub in the tub. Like many dog owners, you may be wondering why on earth our dogs would do such a disgusting thing. And while there’s no finite answer, there are a few theories behind this unpleasant behaviour. Why do dogs like to roll in fox poo? Some say our dog’s poop rolling antics are instinctual from their wild ancestry. While out hunting, dogs would cover themselves in various odours to mask their own scent, making it easier to sneak up on prey. The reason our dogs roll in fox poo could sometimes be our own doing. Flowery, perfumed fragrances from dog shampoos can be overpowering for our sensitive-nosed hounds. 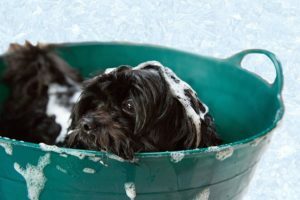 Particularly after a bath, you may find your dog rolls around in just about anything to mask their new scent. Many believe that dogs roll in fox poo simply because they enjoy it and like the smell. Our pooches may see it as a fun activity, similar to chasing a ball or splashing in the sea. When you’re out walking with your dog, keep a good eye on what they’re doing at all times. Watch for signs of prolonged or intense sniffing in one particular area. 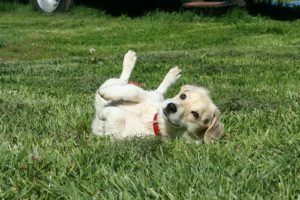 When a dog is about to roll in something unsavoury, they’ll start to slowly turn their neck towards the ground before smearing themselves in it. If you see this behaviour, be quick and shoo your dog away to a poop free zone! Train your dog in a variety of controlled situations until their response is reliable. Start indoors, then take the training outdoors, and then begin creating distance between you and your dog while giving the command. Since you’ll most likely need this command when your dog isn’t right next to you! Having great recall means you can call your dog away when you spot those tell-tale signs. Here’s a great article from Dog trainer Victoria Stillwell on how to perfect your dog’s recall. It can take years for a dog to reliably come when called. But it can be done with training and consistency. Always be sure to praise and reward every time your dog comes to you. If you’re looking for new dog walks in your area, why not check out our comprehensive directory of dog walking routes here. There’s something for everyone!